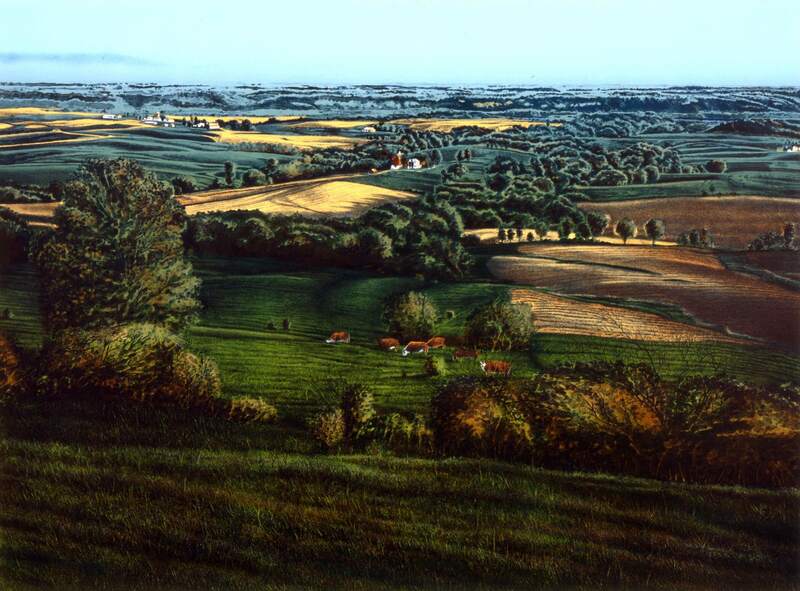 Now in his seventy-fifth year, artist Keith Jacobshagen has been setting the terms in which Midwestern landscape painting is created and discussed for several decades now. It is therefore appropriate that Terra Firma, the exhibition on view at Gallery 1516 until June 12, begins with one of his works. The 2003 oil on canvas” Salt Valley, Late Spring” hangs on the wall just inside the gallery’s front door, under the wall text naming the exhibition and acknowledging its donors. The painting can be viewed as a kind of gravitational center around which the rest of the works in the exhibition rotate. The location of any given work within this constellation is the result of relationships—between earth and sky, nature and abstraction, the human and the sublime—that play out in each work in different combinations. The number of combinations evident in this exhibition of fifty-five works is testament to the curatorial skills of Russ Erpelding, who selected the works in Terra Firma from the permanent collection of the Museum of Nebraska Art (MONA) in Kearney. Take, for example, another work given pride of place in the exhibition, Debra Salopek’s “when I see the birds fly.” This large, square (48” x 48”) oil on canvas presides over the show from the center of the gallery’s back wall. The painting has a layout similar to Jacobshagen’s—both landscapes are about 90% sky with a strip of landscape along the bottom of the image. The sky in Salopek’s work is turgid with clouds and color (though no birds). In Jacobshagen’s work, by contrast, the sky depicted is more quotidian, and perhaps even meteorologically accurate, in its wisps of whiteness stretching across a sky of even blue. Jacobshagen’s intentions along these lines were made even clearer in “A Golden Year,” an exhibition at the Bemis Center for Contemporary Arts in 2011 for which he created 365 tiny (3.5” x 5”) oil paintings on sheets of copper, each depicting the conditions of a particular day. At the same time, however, shapes like the farmhouses nestled in the trees in Ernst Ochsner’s oil on linen. “Lincoln Creek, Summer Storm,” or the smattering of dwellings and cows in James D. Butler’s lithograph “Landscape in Evening Light,” serve as comforting reminders that life goes on notwithstanding the turbulence in the heavens. A slightly comical rendition of this view can be found in Peter Brown’s photograph “Hay Spring, Nebraska, 2005 (turtle),” in which, you guessed it, a rather large turtle sits in the foreground of the landscape in mute testimony to the slowly unfolding everydayness of it all. Another question that landscape painting raises is, how much is required, in terms of paint and gesture, to provide the viewer with a representation of nature. This exhibition provides a range of answers. There is the visual exuberance of Dan Howard’s 1979 oil on canvas “Summer Nebraska,” a flurry of colors and brushstrokes depicting nothing more, but also nothing less, than swaths of meadow and forest nearly overwhelming a corner of psychedelic sky. The most evocative among this exhibition’s answers to the question about the relationship between nature and representation is “The Nebraska Suite,” a series of nineteen small, mixed-media works on paper by Cuban-born, Los Angeles-based physicist-turned-artist Enrique Martinez Celaya. Created during the time Celaya spent as Visiting Presidential Professor at the University of Nebraska-Lincoln from 2007-2010, these works are delicate, at times almost to the point of invisibility. There are other highlights to this show, including two photographs by the great Wright Morris (who will the subject of a solo exhibition at Gallery 1516 next year) and a lovely tempera on Masonite by Aaron Pyle that recalls the work of his teacher, Thomas Hart Benton. I visited this exhibition three times and came away with new thoughts each time. Terra Firma is further evidence of how beneficial Gallery 1516’s partnership with MONA is and will be in the years to come. Terra Firma will be on view at Gallery 1516, located at 1516 Leavenworth, until June 12. For details and hours, go to www.gallery1516.org. Food Trucks This Friday!Shadows loom over memory lane.